I also often put on movies, tv, or music when I work, especially if I'm doing a repetitive task like crocheting or simple sewing. And when I was in school, I'd often be doodling sketches for my next project in between my notes for class. It does help to have something to do with your hands, doesn't it? Yes! It does, i wonder if there is any science behind it… besides the testimonial of hundreds! I'm going to look into it! you have been listening with your ears for as long as I can remember…always something in your hands to do, even as a small child. we never left home without "stuff"! the writing was on the wall a long time ago for you to be a crafter…best wishes with all your ideas! I listen with my ears! I watch a lot of shows w/my husband while I knit and he programs his software and things. It's fun and a nice way to enjoy multitaskin! I've been citing this article for a couple of years now. I'm a doodler–I can't sit in a meeting without a pen and paper, and I NEVER craft without my Netflix! thank you for sharing that Kristi! See it's true! Time says so!! I'm currently 12 movies in on an embroidery marathon and also found myself having to tactfully explain to a training lecturer that I meant no disrespect but would actually listen more and better (because I wouldn't fall asleep, though I couldn't say that) if I kept my hands busy throughout her (deadly dull) lecture. So true! I can't remember the last time I actually WATCHED a tv show . . . I mostly watch my crochet and just listen to the tv! I wish I had this post to show a principal that once told me I was being rude to a fellow teacher who was speaking because I wasn't "paying attention" in a staff meeting. 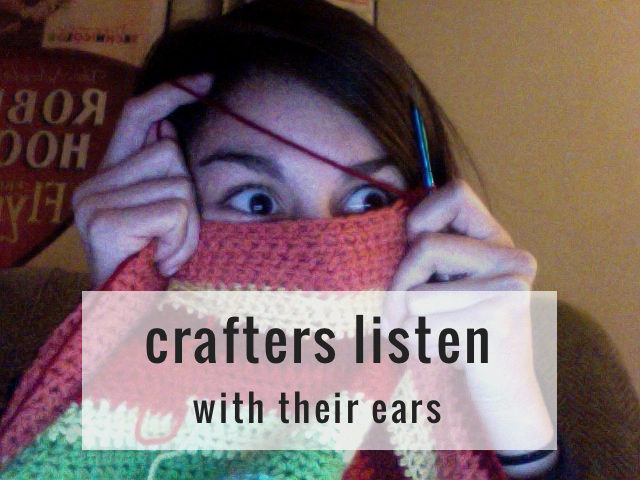 I find it hard to craft without some kind of background noise. I love to cross stitch with a movie or the tv on. Show marathons- Project Runway, anyone?- are great in particular. I constantly find myself surprised by commercials I had otherwise only heard.. They're very different when you watch them! book – show marathons are always a yes – i have all six seasons of dawsons creek, i watch that alll the time! haha i know, i know, but its the best! amy – oh there are definitely exceptions, for example, art history slide presentations – best to pay attention haha! i know what you mean about the commercials, that is soo true!! I can’t remember the last time I watched a movie without having clay in my hands. I think I’d be so fidgety if I had to go without it. I have to have on a movie or show, some sort of background noise while I work. Have to! This is also how a judge if a movie is really good or not. If it can take my attention away from what I’m working on.